For someone looking to get into flying RC helicopters, there are many choices out there. There are beginner RCs, Hobby grade RCs, electric powered, gas powered, coaxial, and multi-rotor options, which can be quite confusing. In this article, we help you navigate these confusing terms, and get you flying the RC helicopter of your dreams. The $100 – $150 price range is a great place to be for new flyers, and beginners looking to upgrade. This intermediate price range is where things start getting interesting with RC helicopters. You get away from the cheap trainers, and move on to models that have better specs and more features. 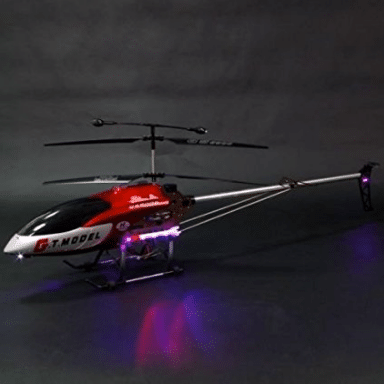 There really is too much to learn about remote control helicopters for one small article, so for now, we recommend going with an electric powered, coaxial helicopter. Using this platform will allow you to develop your skills, keep you from crashing your new chopper, and have loads of fun! Unfortunately, the market is flooded with low quality models, so you have to be careful when shopping. We put together this list of the best RC helicopters under $150 to help you find a quality product. 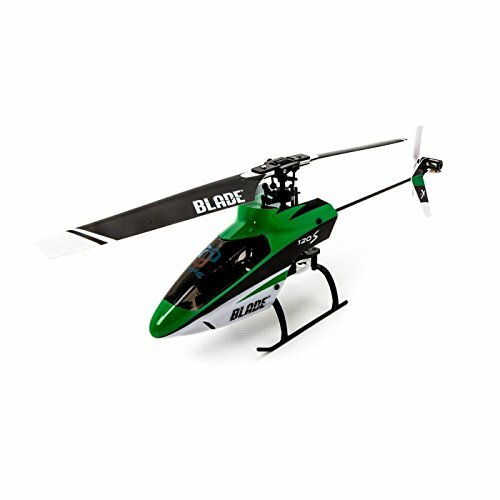 Our number one choice for the best RC helicopter under $150 is the Blade BLH4100. This helicopter out-performs every other model that we looked at in this price range. You will simply not find a better RC helicopter. The Blade BLH4100 comes fully assembled out of the box, which is very convenient. There is nothing worse then having to spend time assembling an RC after waiting for days or weeks for it to get shipped to you. This helicopter is lightweight, yet durable, due to its construction of carbon-fiber parts. It comes with “SAFE” technology, which means it has features that make it harder to crash. For example, it has a “panic recovery mode”, that stabilizes the helicopter with the press of a button. This really allows you to get the most out of your RC without worrying about crashing it every time you try a risky maneuver. The BLH4100 is powered by an E-flite 500mAh 1s 3.7V 25C Li-Po battery, providing a long and enjoyable flight window. There are countless other flight features that make this model a blast to fly, and even better, you can get it at a stellar price. The next helicopter on our list is the Dahzhong Power Star. What we love about this helicopter is that it isn’t fixed pitch, meaning you can do all sorts of fun stuff like flips and barrel rolls that really make flying an RC a great time. It is powered by a brushless motor, which is a nice touch for an RC in this price range. The transmitter has a throttle hold setting, that makes it a breeze to maintain a steady altitude, which can be critical when flying indoors. Product testers reported that this model is super-durable, surviving multiple crashes in tact. The battery on the Power Star is a 3.7V 450mAh 25C that allows for approximately 5-7 minutes of in-air flight time. This is standard for most RC helicopters in this price range. 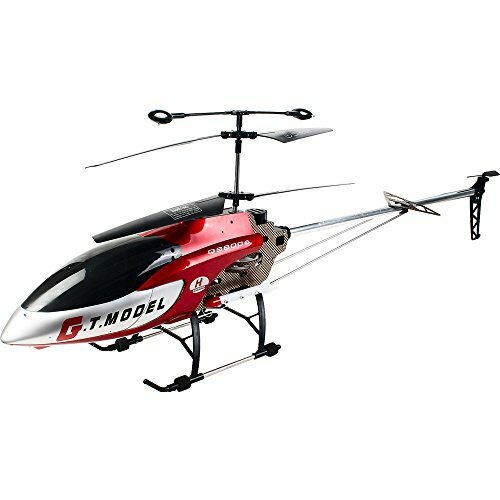 If for some reason you are not satisfied with this helicopter, it comes with a 30 day money back guarantee, which hardly seems necessary at this amazing price. 〖POWER STAR〗The use of non-aileron design to reduce drag rotor head. References aerodynamic design meter blades, high efficiency brushless motor, providing a strong impetus and body self-stability. • 〖SUPPORT 3-AXISs & 6-AXIS GYRO MODE〗Using new electronic gyroscope, set 3-axis and 6-axis gyro modes. 3-axis mode aerobatics, such as flips, rolls inverted flight and funnels. 6-axis mode ultra-stable, especially suitable flight for beginners. • 〖PERFECT BODY〗 Transmitter has 3D aka Idle-Up switch, Throttle Hold switch, large LCD, low voltage warning. Supports switching between 3-axis & 6-axis gyro modes. 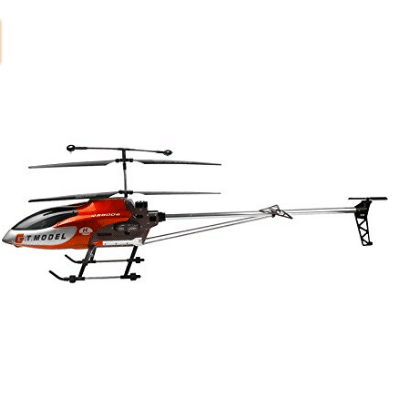 • 〖PORTABLE HELICOPTER〗 Brushless Flybarless helicopter, Ultra-light weight: 58g. After flying this mini helicopter, you will find miniature before flying in front of it will be eclipsed. The last item in our review of RC helicopters is the GT QS8006. This helicopter is a bit different than most we checked out, but it is great anyway. It looks beautiful, flies great, and is a blast to use. We should start off by saying that this helicopter is huge – it measures 53 inches in length. It looks great and has LED lights on it, which makes flying it in the dark really fun. The battery is a 14.8V, 1500mAh rechargeable lithium battery that provides about 7 minutes of flight time. It takes about 3 hours to fully recharge the battery. The remote control uses 4 double A batteries and has a range of up to 100 meters, which is quite a bit of distance. All in all, this is a really fun RC helicopter to fly. It is not the best rated of all time, but it was included because it has a lot of unusual features such as the huge size. Even though this isn’t the absolute best RC helicopter on the market, the crazy low price makes up for the less impressive specs. Controlling the helicopter is extremely fun and easy, allowing you to pilot the helicopter in a variety of ways. This large helicopter is great for both indoor and outdoor flying. 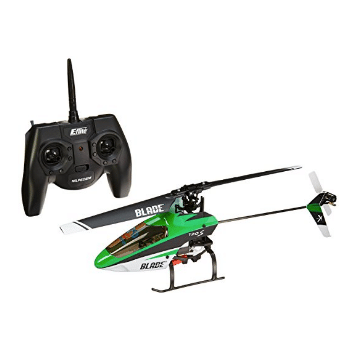 No matter where your RC skill level stands, the QS8006-2 3.5 Channel RC Helicopter is sure to provide you with great flying experience. In the world of RC helicopters, there are many different types and features. It can be difficult to keep track of all of the different terms and what they mean. That’s why we included this list of things to look out for when shopping for an RC helicopter. Internal Combustion – There are many different methods of powering RCs, and one of those methods is internal combustion. Internal combustion RCs are powered by nitro or gas. This power method delivers a larger amount of power, and is usually used on bigger, high end models. Also, nitro and gas are often used for RC racing. 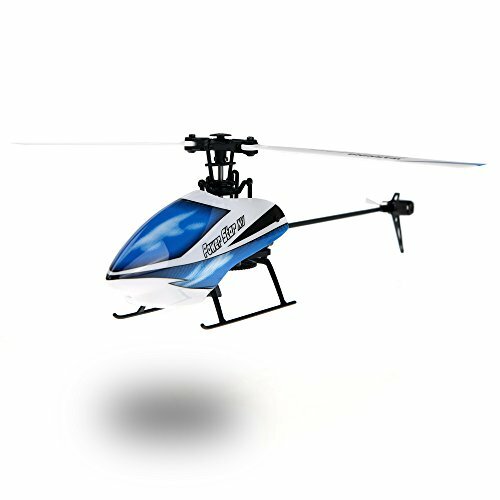 Electric – Electric power is the most common type of RC helicopter in the beginner to intermediate levels. This provides a cost-efficient, and easy to use platform. The electric motors often provide a more stable power source, making it easier to control, which is a great choice for beginners. 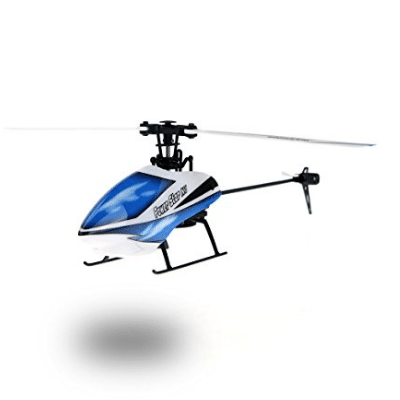 Coaxial – Coaxial helicopters are a more recent technology introduced to the RC market. “Coaxial” refers to the two different sets of blades rotating in different directions. The benefit of this is increased stabilization during heavy acceleration. This is a nice feature and beginners should look for this if they are having a hard time operating single axle helicopters. Number of Rotors – In recent years, multi-rotor helicopters have started appearing. This is what most people refer to as “drones”. If you are looking for a more traditional helicopter flying experience, go with single rotor. If you want to do more hovering and less maneuvering, go with the drone style. If you are looking for something a little different in a helicopter, check out some of our other reviews.